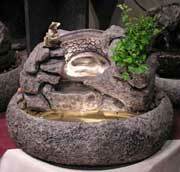 This is a medium sized tabletop water fountain with a hand-sculpted Oriental bridge. The fountain comes with two underwater lights already installed, a fisherman fishing off the bridge and self watering live plants. This relaxing fountain will be delivered to your door, fully assembled, in just 1-2 weeks.